A swan? Me a swan? Ah, go on! In flower from May to November, growing knee-high, and with refined foliage (more Anemone sylvestris than Anemone x hybrida), the standout feature of this relatively new introduction is the reverse of the otherwise pure white bloom – a three painted flashes of liac-purple. With flowers held above the foliage on wiry stems, a gentle breeze animates the whole show, blue, white and the pale lemon of the stamens. I bought three early in the summer for the Strawberry Hill garden I planted out – and bought three more today to put by for the new project in Kew. I’ll probably need more. 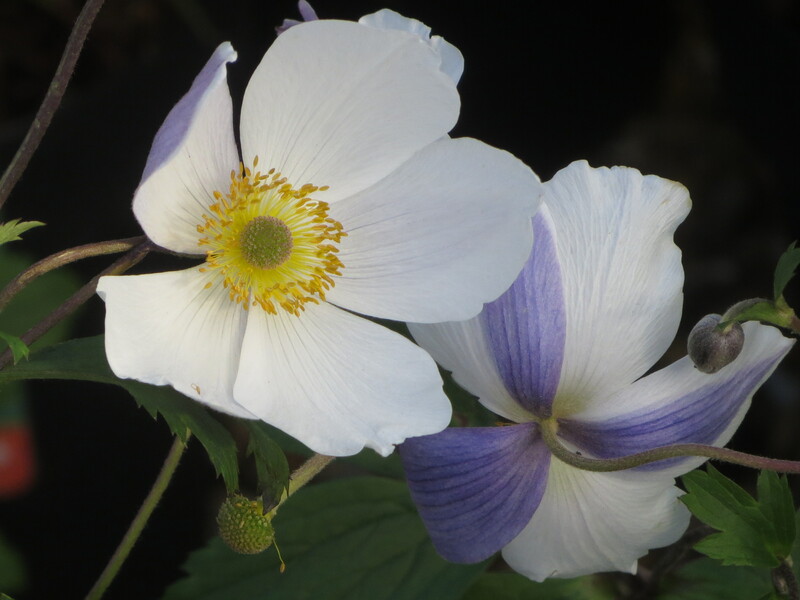 About 12 years ago, amongst a batch of Anemone seedlings, Elizabeth spotted a plant very with different character to the parent and showing real hybrid vigour. This was placed aside to grow on and watch. This young plant was delightful and has since proved to be the most beautiful and long flowering plant we grow. Elegant white flowers, 7-9cm. across are held well above the attractive neat green foliage, each flower has lilac-blue bands on the reverse of the petals and at twilight closes to a nodding lilac-blue and white bell. Flowering is continuous from late May until November frosts. 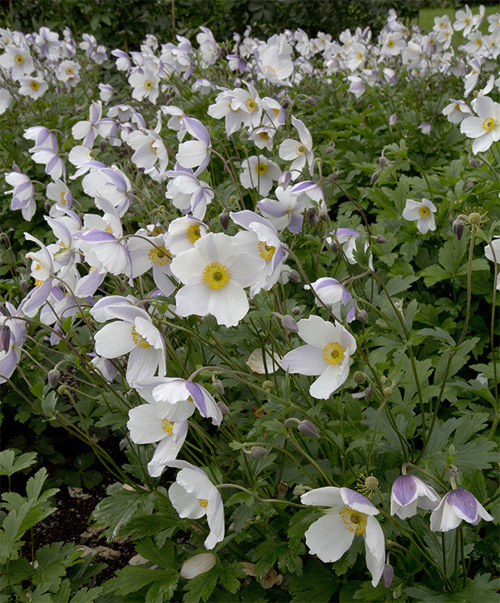 In 2005, greatly encouraged by Roy Lancaster, we decided to try to release this plant to the wider horticultural world, and named it Anemone ‘Wild Swan’, but first it had to be propagated. We have slowly increased the stock, but to produce large numbers tissue culture has proved to be necessary. This has been a long process with many setbacks but eventually we were ready to launch it. It was first shown at Chelsea Flower Show in May 2011 on Hardy’s exhibit, to great admiration, and our thanks to Rosy and Rob Hardy for showing it so well. Anemone ‘Wild Swan’ was awarded ‘Chelsea 2011 Plant of the Year’, a huge accolade and surprise and delight to us. The demand for the plant has been very high, we sold plants at ‘Gardening Scotland’ and ‘Tatton Park’ shows, each time we were mobbed and sold out on the first day. We are now selling it mail-order and on the nursery, available in half litre and one litre sizes. Wild Swan should also start to be sold by other nurseries and garden centres during 2013. Monrovia Nurseries have now introduced it in U.S.A. and in August 2013 it was awarded ‘Best of Show’ of all the new introductions at Farwest Show in Portland OR. You’re a very fine swan indeed! I am a swan! Wheeeeeeee! Say who’s an ugly duckling? ← What a good year for the roses…..